The rapid growth of Amish communities are leading Amish to settle in unusual places, though it seems more likely that they will be heading toward upper Midwestern states in the near future according to sociologists at the recent meeting of the Society for the Scientific Study of Religion in Atlanta, which RW attended. Cory Anderson of Truman State University and Rachel Bacon of Penn State University presented a paper on the movement of Amish communities in recent years, finding that they tended to settle in small farming communities outside metropolitan areas of low or declining populations, usually in topographies of rolling hills, which have cheaper land prices than flat farming lands. Using census results with county-level data and Amish community listings, the researchers forecasted that new communities are most likely to continue moving away from the more congested heartland of Pennsylvania and Ohio and be established in northern Wisconsin and Michigan along with parts of Iowa and even Washington state. One place the researchers didn’t expect an Amish community to take root and grow was in Sarasota, Florida. But in another paper, Italian scholar Andrea Borella found that wealthier Amish and a more “wild” set of younger members have been migrating to the Florida community of Pinecrest in recent years and living distinctly non-Amish lifestyles. Instead of the horse and buggies, the Amish at Pinecrest ride bicycles, play shuffleboard, and even go to the beach in modern bathing suits and bikinis. Borella finds that these Amish see the community as a way to live a more liberal lifestyle at least some of the year. 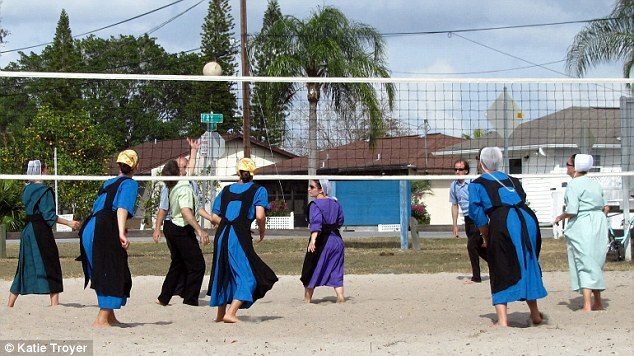 But Amish up north see Pinecrest—which has recently experienced a split between a more evangelical-style congregation with contemporary worship and a more traditional church—as a strange and unorthodox community. Commenting on the paper, Anderson said Pinecrest may function as a “place set aside for deviance to occur in the Amish community;” he noted that even when they are experimenting with an alternative lifestyle, Amish tend to do it together. Some of the younger residents may be on “rumspringa”—a period when teenagers are allowed to interact with the outside world before they make a commitment to the church—and many are not yet baptized.